In this short video (on the right) Susan Dunlop, the curator of the Wellington County Museum & Archives, gives us the story of this wooden land roller. It was very hard to find images of wooden land rollers and in the end I had to settle for metal ones. However, the way they are used is the same. Logs were more handy and far cheaper than metal when these devices first came into use. But metal was superior in the end and prices came down to make them more affordable. I took a piece of the wood to have it identified. My own feeling is that it might be elm. It is very hard to tell as the wood has deteriorated and is quite soft. Cutting up the roller disturbed a rather large nest of ants. Even after getting the pieces back to the studio, there were still some that were late on leaving. 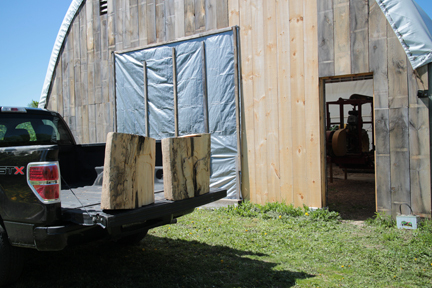 I took the wood to the sawmill and aftersome thought and discussion we decided to cut it into slabs suitable for making platters. 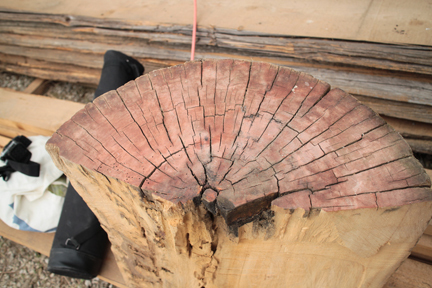 In this case, a platter is the best way of 'showing off' the wood. Due to the wood being so uniform in grain one needs a larger visible area to get a feel for the subtleties in it. Each cut brought a different perspective on the roller. 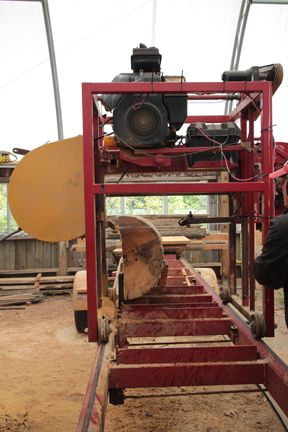 This video covers the highlights of making the platter from the land roller. 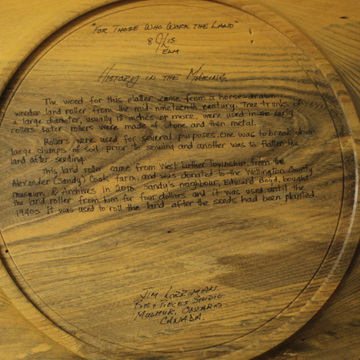 "For Those Who Work the Land"
The story of the wooden land roller has been written on the back of the platter.